Neil Harman, plagiarism: The All England Club discovered journalistic malfeasance in its annual Wimbledon yearbook, and kept selling it anyway. 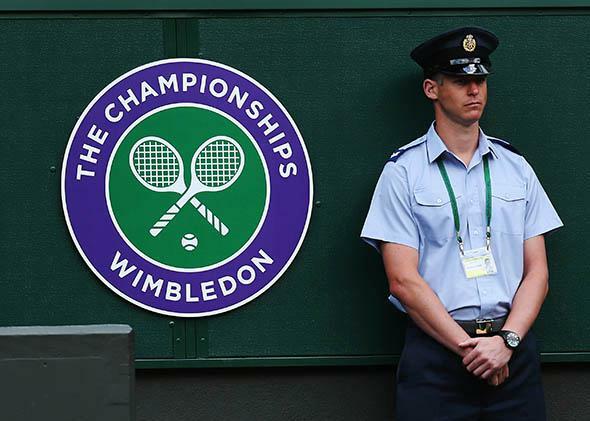 The All England Club discovered that its annual Wimbledon yearbook was full of plagiarism. The club kept selling it anyway. Where tennis tournaments are held and yearbooks are sold. By the end of this year’s tournament, which was contested from June 23 to July 6, the 2013 annual had been removed from the Wimbledon bookshelves. It has also been removed from Wimbledon’s online shop. The book should have disappeared from circulation long before that. Months earlier, as first reported today in the U.K. magazine Private Eye (the article is not currently available online), Wimbledon employees had learned that the author, Neil Harman, had plagiarized large swaths of the 2013 book. Regardless, the title remained on sale until just before the tournament’s end, when the All England Club was confronted by a writer whose work had been pilfered. Harman, who had written the Wimbledon annual for 10 consecutive years, was not assigned that task for 2014. He did, though, still write a piece on Andy Murray for the tournament program. In addition, Wimbledon allowed him to keep his credentials, and invited him to attend the tournament’s exclusive Champions’ Dinner. The club also failed to notify writers whose work they knew had been plagiarized. Harman, a correspondent for the Times of London, is a pre-eminent figure in the tennis press, having written a book with Andy Murray and served as president of the International Tennis Writers Association. This spring, Harman was called into a meeting with Wimbledon officials. The All England Club had been told that large chunks of the book had been taken from other sources without attribution, and subsequently verified that accusation. In the second set, Bartoli comforted herself like a 12-year veteran, going through her routines between points—quirky as they are—and betraying little emotion. Stephens looked the part of the 20-year-old sophomore, rolling her eyes at misses, taking more risks than the situation demanded, approaching the net as though under duress. After recovering from a 3-5 deficit and rousing the crowd, Stephens had all kinds of opportunities to level the match. Forehand sailed long, backhands curled wide, first serves hit the net. Bartoli won 6-4, 7-5. Page 87 of the 2013 Wimbledon annual has the following passage, which lacked any attribution. In the second set, Bartoli comforted herself like a 12-year veteran, going through her routines between points—quirky as they are—and betraying little emotion. Stephens looked the part of the 20-year-old learner-player, taking more risks than the situation demanded, approaching the net with small steps rather than entirely confident in her movement. After recovering from a 3-5 deficit which roused the crowd, Stephens had all kinds of opportunities to level the match. Instead, forehands sailed long, backhands curled wide, first serves hit the net. Bartoli won 6-4, 7-5. The paragraphs are nearly identical, though with the Americanism sophomore changed to learner-player in Harman’s version. Even Wertheim’s typo of comforted (he had intended to say comported) remained. There was a whole lot more. My personal review of the 2013 book found 14 large passages taken without attribution. Further, my examination of his writing for the previous two Wimbledon annuals revealed at least eight instances of obvious plagiarism in the 2012 book, and a staggering 30 in the 2011 edition, bringing the total to at least 52 in the last three books. I have yet to examine the 2004-through-2010 books. Of these 52 examples, 28 of the passages were lifted from the Guardian. Six were from the New York Times, five from either the Times of London or the Sunday Times, four from Sports Illustrated, four from the Telegraph, four from the Independent, and one from the New York Daily News. In two additional cases, Harman borrowed from his own previously published work. I didn’t count these among his 52 instances of plagiarism. While some of the examples I found were as short as a single borrowed sentence, the majority spanned multiple paragraphs, usually with no attribution whatsoever. Stakhovsky lost the first set on a tie-break but an hour and a half later he was storming his way through the fourth, still charging to the net on gangly, coltish legs that seemed never to tire. At the end he fell on his back on the grass, a final collapse to end the day as Centre Court rose to applaud not just one of the great shocks, but a brilliant, and brilliantly unexpected performance. It had all started so well for Federer, who emerged to the usual champion’s reception, not just applause and cheers, but swoons and sighs as this familiar old fuzzy-ball genius ambled out in his tailored tunic to face a player who had never before beaten a top-10 opponent. It had all started so well for the Swiss, who emerged to the usual champion’s reception, not just applause and cheers, but swoons as a familiar old fuzzy-ball genius ambled out in his tailored tunic to face a player who had never before beaten a top-10 opponent. America’s tournament started with a midday meeting of two men—Alexander Bogomolov Jr and Donald Young—who have defeated Andy Murray in the last six months. Both have hovered around the top 100, although watching Bogomolov get the best of four uneven sets it was tempting to see those results as decisive proof of the depth of Murray’s doldrums at the time. At least Court 17 seemed a poignant location for a display of American grass-court tennis 2011 vintage, lodged in the shadows of Centre and No1 court, its seating so shallow passersby lean in at the edges like neighbours craning across a garden hedge. At one stage Bogomolov lost his grip on his racket and sent it hurtling over the midget-level rear awning and clattering on to the Tarmac walkway outside, narrowly missing a pedestrian. There were no stars and stripes flags here, not even a celebratory whoop or yowl or “Yoo! Ess! Ay!” as the backwards-capped Bogomolov broke in the second set to shift the momentum of the match. Young, a lovely mover possessed of an elegant backhand slice, is seen as a little fragile and so it proved in the face of the more aggressive Bogomolov. Their tournament started with a midday meeting of the two men—Donald Young and Alex Bogomolov Jnr—who had defeated Andy Murray in the first round of the Masters 1000 tournaments in Indian Wells and Miami in March. Both had hovered around the top 100, although watching Bogomolov win in four sets, one was tempted to see the result as decisive proof of the depths of Murray’s doldrums at the time. At least Court 17 seemed a poignant location for a display of American grass-court tennis 2011 vintage, lodged in the shadows of Centre and No.1, its seating so shallow that passers by lean in at the edges like neighbours craning across a garden hedge. At one stage Bogomolov lost his grip on his racket and sent it hurtling over the midget-level rear awning and clattering onto the Tarmac walkway outside, narrowly missing a pedestrian. There were no stars and stripes flags here, not even a celebratory whoop or yowl or “Yoo! Ess! Ay!” as the backwards-capped Bogomolov broke in the second set to shift the momentum of the match. Young, a lovely mover possessed of an elegant backhand slice, is seen as a little fragile and so it proved in the face of his more aggressive compatriot. These examples, while egregious, are not unrepresentative—there are many similar appropriations across the 2011, 2012, and 2013 Wimbledon yearbooks. 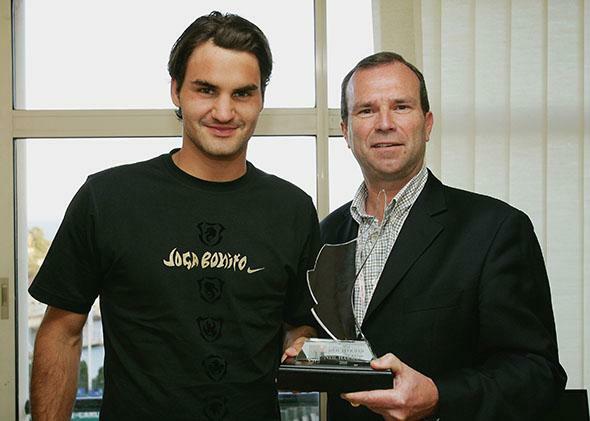 Roger Federer poses with Neil Harman after he received the Roy Bookman Media award during the Rolex ATP Tennis Masters Monte Carlo on April 22, 2006, in Monte Carlo, Monaco. Wertheim did not know at the time that Harman’s plagiarism extended beyond the 2013 book. Update, July 25, 2014, 10:25 a.m.: Neil Harman has been suspended by the Times of London “pending an investigation into allegations of plagiarism in another publication,” according to a Times spokeswoman. Harman has also deleted his Twitter account. Ben Rothenberg collected five more examples of Harman’s plagiarism.